IN A move to help low-wage workers, the labour movement is going to pay 90 per cent of the course fees for them to get a Class 3 or 4 driving licence. This means they pay about $200 or less, instead of $2,000, for a Class 3 licence to drive cars and vans. A Class 4 licence for heavy vehicles will cost them $171.50, instead of $849.11. But the subsidy will be given only to Singaporeans and permanent residents who want jobs in the transport and logistics industry, where there is a severe shortage of such drivers, said the National Trades Union Congress (NTUC) yesterday at its launch. Another condition is that they must earn $1,700 or less a month, or have a monthly income of $1,400 or below per household member. The jobless can also apply for the subsidy. The scheme, introduced by the NTUC's transport and logistics services cluster, was cheered by Mr Siva Balan, who had wanted a Class 4 licence since last year. He signed up yesterday, and hopes to get a job as a tour bus driver. Under the scheme, job seekers are also paid a training allowance, and can finish the course in six to nine months, instead of the usual 12 to 18 months, because lessons will be intensified. After getting their licence, they will be placed in such jobs as delivery van drivers and bus drivers. 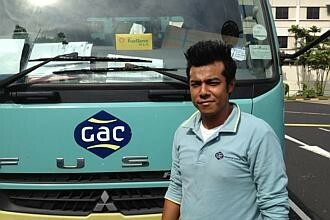 Mr Azmeer Rohani, 32, made the leap to a Class 4 licence when the scheme was being tested under a pilot programme. He now earns $2,700 a month as a driver and operations executive in a logistics firm, up from $1,700 previously when he drove new imported cars off ships. Many who respond to its job ads are foreigners. The transport and logistics services cluster also presented its progressive wage plan yesterday - the first sector to do so since labour chief Lim Swee Say introduced the concept last month for cleaners. The plan sets out a wage ladder which workers can climb. For instance, despatch riders with Class 2 motorcycle licences earn $1,000 to $1,200 a month. With a Class 3 licence, they could make $1,300 to $1,500 as a van or taxi driver. Becoming a bus captain, with a Class 4 licence, could mean $2,200 to $2,500 a month. Other industry clusters will reveal their progressive wage plans in the months ahead, said NTUC.